Would you like to discover all of the many ways that you can finance real estate? Want to learn how to cut your financing costs, avoid pitfalls, and negotiate the best terms? 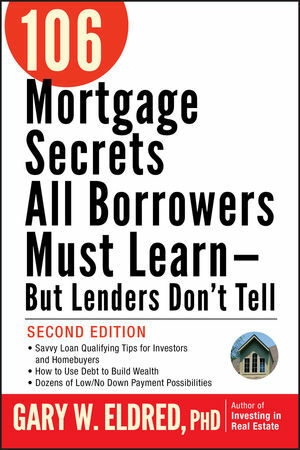 Then let Gary Eldred's 106 Mortgage Secrets All Borrowers Must Learn--But Lenders Don't Tell, Second Edition guide you. Fully updated, this practical guide explains how today's changing mortgage market really works. Unlike other mortgage guides, this book goes beyond traditional bank-originated loans and shows you how to benefit with seller financing, assumables, subject-to, wraparounds, lease options, foreclosures, and other money-saving possibilities. Simple, concise, and comprehensive, this book reveals everything property buyers need to know--especially the 106 financing secrets lenders too often omit. Gary W. Eldred, PhD, has invested successfully in real estate for more than twenty years and has served on the graduate business faculty at Stanford University and the University of Virginia. He has authored many other real estate titles, including Make Money with Affordable Apartment Buildings and Commercial Properties, Second Edition; Trump University Real Estate 101; and Investing in Real Estate, Fifth Edition, all from Wiley.